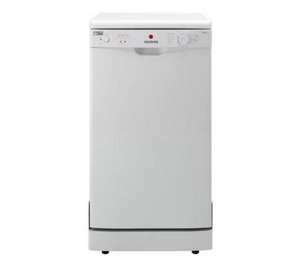 Thought this was a great deal, a branded slimline dishwasher for less than the cheap and nasty brands out there. Obviously not for everyone but if you have been waiting for one of these then getting a well known brand for <£200 is a bargain. I was ready to buy a Beko / Bush for more money. And a free flight too! Read the reviews regarding plate sizes. It would seem dinner plates do not fit in this. Forgot to say, it is the same price on Dixons if anyone prefers to order from there. Also 3% from TCB or Quidco. @ Sharpe - depends on the size of your dinner plates I suppose. I have only seen two reviews, one mentioned it as a problem, one didn't. Apparently the top shelf can be lowered so perhaps its just people being stupid??? I will have a look at one before I buy! Pre hotukdeals so they cant blame us. My mum used to have a slim dishwasher and it was more than useless unless you was on a diet. You're presumably quite young if you don't remember … You're presumably quite young if you don't remember this:http://en.wikipedia.org/wiki/Hoover_free_flights_promotionPre hotukdeals so they cant blame us. Indeed, and now Hoover is owned by Candy, so no better than the budget models out there. Sorry morpheus. Cold. As I said though, each to their own. Agree with you mate, but that doesn't necessarily make this a hot deal. The Bosch slimline is occasionally reduced at Comet, and this has served me well for over 5 years, so I'd recommend that if time is not an issue. Apparently the top shelf can be lowered so perhaps its just people being … Apparently the top shelf can be lowered so perhaps its just people being stupid??? I will have a look at one before I buy! Hi mate, where did you see about the top shelf being height adjustable? Have just got back from Currys and it did seem like it could be raised as there was a second set of runners on it, but the instruction manual didn't seem to mention it. Most websites insist the top basket is NOT height adjustable, but having looked at the machine in Currys, it looked IDENTICAL inside to this Kenwood machine that DOES have a height adjustable top basket.... need to find a manual for the Kenwood to see how it adjusts. Coming up as £249.99 when I use the link. I bought one of these instead for £225 - 3% Quidco dixons.co.uk/gbu…tml Get it on saturday!